Opening ceremony of the Universidad de los Andes Caribbean campus in Cartagena on May 10, 2018. Press conference at the launch of the Universidad de los Andes Caribbean campus. 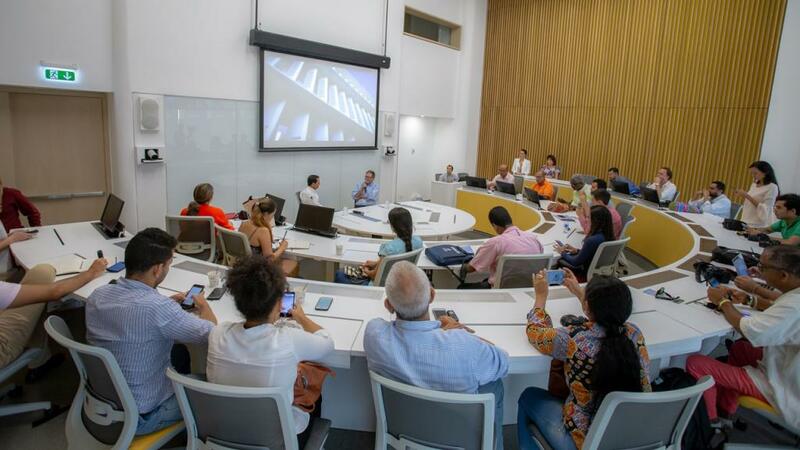 In May 2018, the Universidad de los Andes opened its doors to its Caribbean campus, and, for the first time since it was founded seventy years ago, it expanded from its main campus in Bogotá to another city – the exclusive Serena del Mar urban complex in Cartagena de Indias. 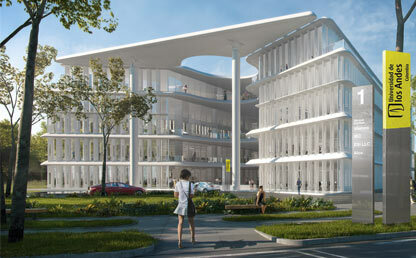 The building was designed by the renowned architect Brandon Haw and is located 12km from the city center. It has classrooms, offices, recreation areas, co-working spaces, all of international quality, and also provides spaces for the development of academic programs as well as initiatives that contribute to the progress of the city and region. To begin with, the university will offer further education programs and, at a later date, post-graduate diplomas and Master’s degrees. 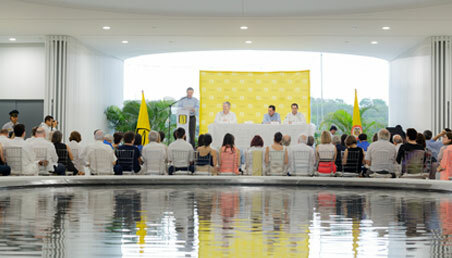 Before the opening ceremony, the Dirección de Posicionamiento at the university organized a press conference with the university’s vice-chancellor, Pablo Navas, and the president of Serena del Mar, Daniel Haime, who explained the advantages that opening this new educational center will bring to the national and local press: “this is an open door for the academic community; not only for Colombian universities. We are working together to make alliances with other universities internationally to create academic programs that will be taught in this campus”, highlighted the vice-chancellor who invited journalists to join him for a walk around the campus. The main table was comprised by Eduardo Pacheco Cortés – the president of the University´s Superior Council, Daniel Haime – the president of Serena del Mar, and Brandon Haw – the building´s architect and designer who gave a warm welcome to the prestigious institution. When night fell, guests celebrated and toasted with a glass of wine while a firework display illuminated Cartagena´s skyline. 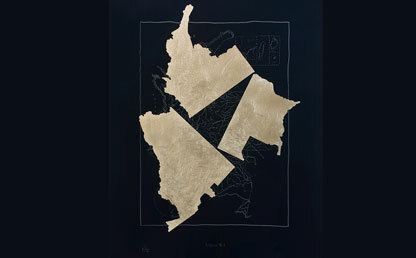 The event ended with a Cooperation Arrangement agreement signed between the Universidad de los Andes, the Universidad Jorge Tadeo Lozano, the Universidad del Norte, and the Universidad Tecnológica de Bolívar. An alliance was consolidated between private and public higher education institutions from the Caribbean to promote inter-university and inter-institutional activities that addressed the region´s future challenges. As midnight arrived, the historian José Vicente Mogollón gave a conference on the history of the north of Cartagena about its paths, towns, and beaches. This was followed by a lecture by professors from Los Andes and from the Caribbean who talked about topics such as health, biodiversity, peace, art, and culture in the Caribbean. For all the lectures given during the opening ceremony at the Caribbean campus, click here. On Saturday, after a busy opening day, the campus was the setting where the Uniandino spirit was fueled. Around one-hundred alumni from different faculties reunited to interact and exchange ideas and knowledge as part of a networking initiative that was led by Eduardo Behrentz – the Vice-Rector for University Development and Alumni Relations. 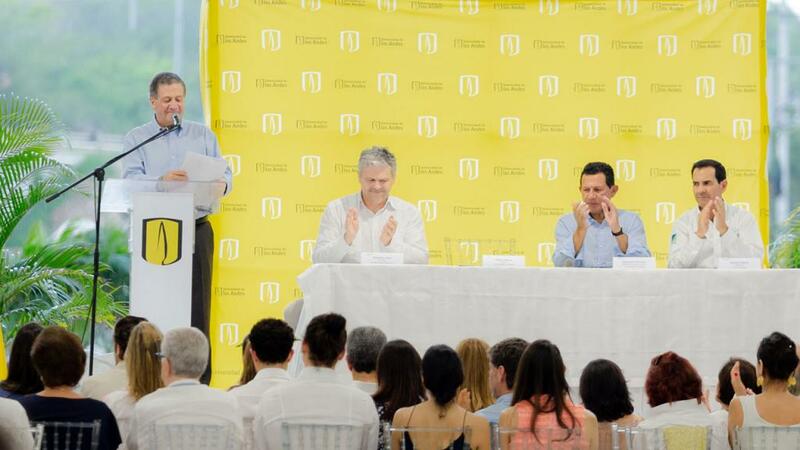 Over these three days, the Universidad de los Andes one again reaffirmed its commitment to quality education in Colombia, as well as its hedging its bet on regionalization, and, through this, its contribution to the country’s development and progress.